In Australia the breed is in its infancy, only having been introduced in 1990. 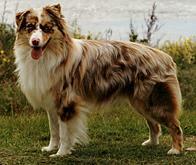 Australian Shepherds were fully recognised by the Australian National Kennel Council on January 1, 1994. Since then, the dog has gained considerably in popularity, competing successfully in conformation, obedience and agility. "Grinning" is a characteristic of some Australian Shepherds and is not to be mistaken for snarling. 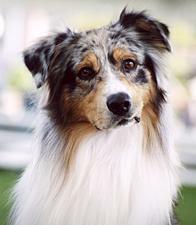 The Australian Shepherd is perfect for the person wanting a highly trainable dog. If you have the time and commitment to take on an Aussie Shepherd, you won't be disappointed.